Flame-retarding coverings BP-H and BN-OF - Lichtgitter one of the worldwide leading manufacturers of gratings - Gratings made of steel, gratings made of stainless steel, gratings made of aluminium, GRP-gratings, gratings fpr sun protection, gratings for coverings, perforated metal planks, pressure-locked gratings, forge-welded gratings. 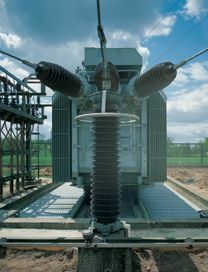 The flame-retarding coverings BP-H and BN-OF got accepted as an alternative to the usual coverings of transformers with coarse ballast. The traditional system was certainly established in the past but shows compared to the Lichtgitter flame-retarding coverings real disadvantages especially regarding the labour costs for maintenance and servicing of the transformer.